Gather your friends (and their mixers) or go solo and give this project a try. Without further ado, I’d like to introduce you to our new HGGH resident home sausage maker, Sean Sullivan of Spectacularly Delicious. Please welcome Sean and his mad skills to the HGGH guest post fold! All images provided courtesy of Sean Sullivan. In the early ‘90s I got a job at Good Housekeeping magazine, a real dream gig, what with the GH Institute and its recipe development, product testing and famous Good Housekeeping Seal and all. One of the highlights of the year was “the sale”. Every cookbook published that year gets sent to the mag for possible coverage in addition to every new kitchen gadget and really almost everything women’s magazine readers might want to read about. At year’s end the mountains of books and gadgets and odds and ends are sold to employees at ridiculously low prices, with all the money going to charity. The impending sale causes a near-frenzy, so a lottery system was put in place to prevent stampedes. The cookbook tables were always well organized by category and I immediately gravitate to the make-it-yourself stacks: canning jellies, jams, pickles and relishes; homemade mustard; “easy” cheese making (a very liberal term because those recipes are extremely daunting); and then, my date with destiny, a guide to homemade sausages. 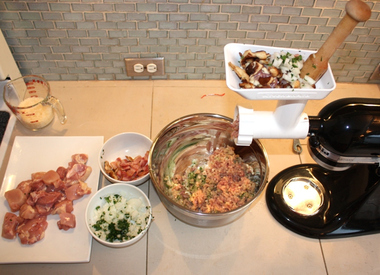 The director of the Food Appliances department pointed out that KitchenAid makes a great meat-grinder/sausage stuffer accessory that hooks right up to their iconic stand mixers. The rest is history. Early triumphs included duck and pistachio; pork and broccoli rabe; lamb links flavored with mint; and bison with hot peppers. The combinations are limited only by your imagination and taste preferences. When it comes to spices and herbs, abundance trumps caution. 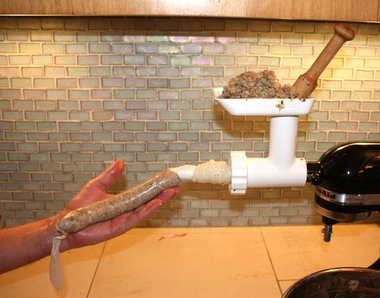 If there’s a secret to sausage making, it’s that you need to add more fat than you’d think. Not quite as bad as the shock of how much sugar is needed for jams and jelly, but still. Lean = dry = dreary sausages. Call your local kitchen store before trekking out to buy the grinder & stuffer attachment (Many stores only carry the grinder and have to special order the stuffer.) You can also hit up Amazon or your preferred online retailer. Butchers at regular old grocery stores as well as upscale establishments have always come through with the casings. Make nice and they’ll sell (or even give away!) 10 yards or so. If you need to purchase an entire hank of casings it will set you back about $20, but they come packed in salt and stashed in the fridge they last for an eternity. 1. Cut up 6 thick slices of bacon into 1” pieces and render some of the fat over low heat in a pan on the stove top. Do not brown. Remove bacon pieces and set warm grease aside, still in the pan. 2. 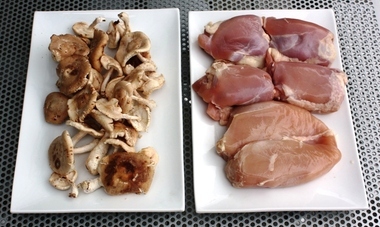 Trim stems from 1/2-lb Shiitake mushrooms and wipe caps clean with a moist paper towel, and then cut into quarters. Over low heat, sauté them in the bacon fat for 5 minutes until they soften, absorb the fat and brown just a bit. If things look a little dry, add a pat of butter. Let cool. Put the bowl into the fridge for at least an hour so it all gets good and cold. 5. 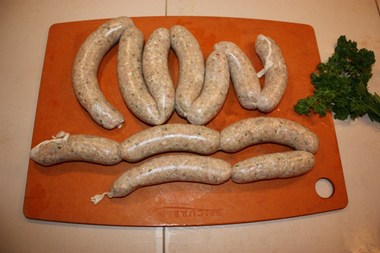 Cut the sausage casings into manageable lengths, about a yard long. You’ll use approximately two yards for this recipe. 6. 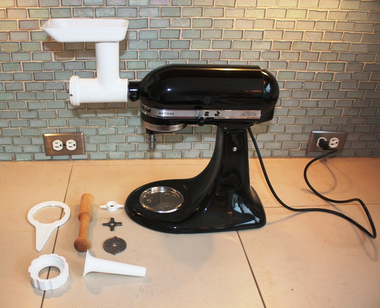 Affix your grinder to the stand mixer using the medium-size cutting disc (according to manufacturer’s directions). Place a large bowl beneath where the ingredients will be coming out. Pass the meat mixture through the grinder set on medium speed (the 4 setting on my mixer). When it’s been through once, mix well again in the bowl with a spatula and then pass everything through the grinder a second time. 7. 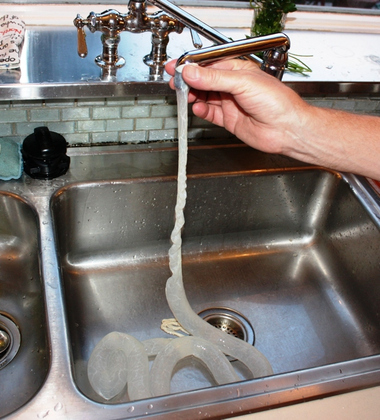 Remove the cutting disc from the attachment and replace it with the stuffing funnel. Slip one casing onto the funnel, bunching it up so it’s on the funnel. Very important: before you start stuffing, tie a knot at the end the casing! Repeat with second yard-long casing when you run out of room in the first casing. You can cook up your sausages immediately on the stove or on the grill (medium-low heat is best so they don’t burst), or keep them in the fridge for up to 3 days (or the ‘use by’ date on your chicken packages). They freeze beautifully too. For further instruction, check out my how-to video; it’s not the same recipe but the technique and tools are the same. Enjoy!